Good day, everybody! Here is hoping that you’re doing well today and that the weather is cooperating in kind, as we just experienced temperatures well above 70 here in Nueva York on Monday! Of course, I misplaced my sunglasses during the winter, so the search for them continues in earnest once this blog is over. There’s some wonderful framing in this puzzle because, well, actual framing is what’s being done in the grid. 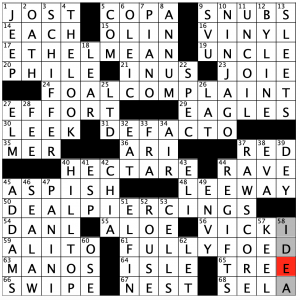 Each of the answers on the perimeter of the grid is a word that can also come after the word “main.” The entry smack dab in the middle of the grid, MAINFRAME, acts as the theme’s reveal (37A: [Powerful computer…or a hint to figuring out the “edgy” puzzle theme]). The grid definitely hit on something that’s close to my heart, given my Nigerian heritage and the occurrences of the BIAFRAN War back in the 1960s, a conflict that gets lost in talks about civil conflicts and other noteworthy/tragic wars throughout history (24A: [Nigerian secessionist state of the 1960s]). If I remember correctly (and I can ask my mother once more for confirmation), both my parents, who grew up in Lagos and away from the Southern part of Nigeria in which Biafra is contained, came to American right before that war escalated to what it became in the late 1960s. “Sports will make you smarter” moment of the day: NAP (7D: [Snooze]) – Did you know that, from 1903 to 1914, the current professional baseball franchise in Cleveland was called the Cleveland Naps, eponymously named after one of the team’s greatest ever players, NAP Lajoie? Lajoie, whose fill first name was Napoleon, led the American League in batting average five times (1901-1904, 1910), hit for the Triple Crown in 1901 and was elected into the Baseball Hall of Fame in 1937. Lajoie’s managerial career ended after the 1914 season and, when he was sold back to the Philadelphia Athletics after that year, the team had to come up with a new nickname, which is the insensitive/racist/callous mascot that it has in the present day. Boy, I don’t know what this theme is doing in a Tuesday puzzle. Does it not feel more like an easy Thursday trick than a Tuesday/Wednesday themed puzzle? Each Across answer has a pair of clues, one cluing the word forward and one cluing the word that appears backwards. For example, 21a. [Entertainer Marx / Entertainer Winfrey] for HARPO back, OPRAH forward. If there is some order here—which ones list the forward word first vs the backwards word instead—it escapes me. All the Down answers are regular, though PEP and RADAR are palindromes and that feels weird in this puzzle. GATEMAN/NAME TAG and REVILED/DELIVER are familiar palindrome pairs to wordplay aficionados. The shorter ones are less interesting, less showy. 43a. [Info, informally / Spirited mount], DEETS/STEED. DEETS is slangy shorthand for details and I picked up the usage from a friend—but I rarely use it because I’m not sure it’s common enough to not confuse people. Where do you land on the DEETS issue—pro or con? 54d. [“It’s ___, not a science”], partial AN ART, ha. This was in the Sunday NYT, too, clued as [Not a science, but ___]. I wasn’t keen on it a couple days ago, either. 24d. [Pose again, as a question], REPUT. I started with REASK, as I’m sure most of you did, too. This is terrible, and the USC/CSU crossing didn’t redeem it. I’m leaning 3.3 stars here, unless there is some elegance to the ordering of the clue pairs that I have missed. Meh. This unfortunately isn’t my type of puzzle. I prefer something with a bit of wordplay or at least a common beginning/ending, but this just feels like a list of similar things. I also wonder if GOT IT was originally supposed to be a 5th themer (in the form of a statement), since it’s synonymous with the actual themers. It could have very easily been that UNDERSTOOD? was the “revealer” and the other four were themers. 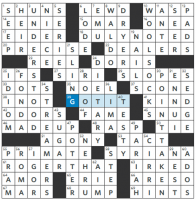 I’m sure this puzzle will work for some folks, but it didn’t excite me as much as some recent WSJ offerings have. 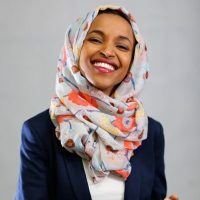 I very much liked seeing Congresswoman Ilhan OMAR in the grid and I enjoyed the clever clue for EIDER [Duck down]. [A foot has five] for NAILS felt gross to me for some reason, and I wasn’t a fan of the imperialist cluing for LIMA [Capital founded by Pizarro]. What about the people who were there before him, even if it wasn’t called LIMA at the time? Other than that, it was a pretty smooth grid! I almost didn’t get this theme, but you have to read the title as “No ‘RM’ Core” for this to make sense. The theme answers all have the letters RM removed from the middle of a six letter word. Puns ensue! The reason I had trouble understanding the theme, since I thought 17A was a play on Ethel Mertz, not Ethel Merman. Perhaps the clue should have referenced Ethel Merman instead of the neighbor from the I Love Lucy show. Anyway, I spent too long trying to figure out how to change MEAN to MERTZ, but when the theme did hit me, my “a-ha!” moment was a long “Ooooooooooh!”, and that was satisfying. Again, it took awhile, and I was a little delayed because I had to stay up and watch the NCAA men’s final, which went to OT (of course! ), so Tuesday will be a looong day with little sleep. And that is not good, since the Jeopardy! test is later tonight!! Anyway, thanks for some more fun wordplay, Matt. 4.3 stars for this one. 1A [“Weekend Update” co-anchor Colin] JOST – This SNL staple is very popular and funny, but it is also past my bedtime. Am I the only one that consumes this via YouTube or Hulu? 21A [“___ I Believe” (2018 song by Clean Bandit)] IN US – Here is your obscure reference for the week, at least to me. For whatever reason, I don’t listen to much pop music, so I have no idea how popular this song is/isn’t. 56A [Actress Lawrence of “The Cool Kids”] VICKI – … or perhaps this may be more obscure for you. This show is fairly new, but I know Vicki Lawrence from a lot of her work from 30 years ago! 63A [Hands, in Spanish] MANOS – You don’t often see this in plural form. 9D [“Law & Order: ___” (spinoff that will break a record for longevity)] SVU – I think the original Law & Order had the record for the longest drama show, which I believe Matt is referencing here. The formula is essentially the same for each show, but maybe Americans prefer the slightly more disturbing stories from SVU. I hope I’m wrong, but it sure doesn’t seem that way. 11D [Straighten, as a hose] UNCOIL – I had UNKINK, because that is what I do to MY garden hose! 28D [Greens ___] FEE – I need to shoot a round or two of golf before the US Senior Open starts in June, where I am helping to run the leaderboards! 39D [“Who ___” (Cincinnati Bengals chant)] DEY – The Saints have “Who Dat!” as their chant; even a sports fan such as myself is not as familiar with this Bengal chant, but then again the Bengals are usually horrible! Again, I didn’t see the circled entry in my computer-altered version of the puzzle, and I am not fast enough to pick up on all the “ant” references! I think I am familiar enough with a worker ant, a drone, the queen, and a soldier ant, and these are all preferable to fire ants! I am not a fan of insects in general but the constructor actually sent a pic to use, and I still didn’t put two and two together! 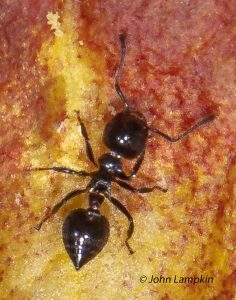 This picture was accompanied by an explanation: “The Crematogaster genus of ants has a cute heart-shaped gaster which gives it one of its common names, the Saint Valentine’s Ant.” Very nice, but I still would stomp it if I saw this in my bedroom! 4.5 stars today! More fun stuff, from the Downs, of course! 12D [Amtrak employees] ENGINEERS – You almost never see this un-abbreviated! 30D [Japanese golf great Aoki] ISAO – This is crossword fame right here. He hasn’t golfed in years, but us crossworders know exactly who this is! 35D [Bausch partner] LOMB – I wear glasses and/or contacts virtually all the time, so this was a gimme! 42D [“Please don’t bite me!”] NICE DOG! – Great entry! Best in the puzzle. This evokes a vivid mental image! 48D [Peter of Peter, Paul & Mary] YARROW – This is slightly tough, even for my old carcass. Doubly tough when you are not using the crossings! Ah! Spring is in the air! And the birds have come out to play in today’s Universal. THEME: Birds and their various positions. 17A [Use as a hiding place] DUCK BEHIND. 29A [Find fault with] GROUSE ABOUT. 44A [Take, as medicine] SWALLOW DOWN. A very consistent set of themers in that none of the entries originally have anything to do with actual birds at all and each ends with location in a sense. Are there any others that would fit this formula? The theme doesn’t strain the grid either, so there’s plenty of room for great fill which Greg clearly took advantage of with longer downs like EQUAL PAY, BED SHEET, NO SHOW, A AVERAGE, CROCKPOT and WAINSCOT (which is new to me). Snag for me was writing in a C for KLINGON/KAHN and I had to scan the puzzle several times before I found my error, which is obvious in retrospect. This entry was posted in Daily Puzzles and tagged Alex Eaton-Salners, Craig Stowe, Elizabeth C. Gorski, Greg Johnson, John Lampkin, Matt Jones. Bookmark the permalink. Amy – the note included with the NYT puzzle indicated to me that there was no order to the forward or backward clues/answers. They’re just in alphabetical order within each pair. And what did that have to do with solving the puzzle? Big whoop. Another vote pro-DEETS. Made me smile in the puzzle. Amy, I think this was a terrific Tuesday puzzle. The fact that each across entry had two clues made it easier, certainly easy enough for an interesting Tuesday. I love it when Monday and Tuesday puzzles offer something unusual while remaining on the easy side. This puzzle seems to me an excellent example. I loved it too. It was a perky little Tuesday, not difficult, and although perhaps a little restricted in the kinds of words that it could contain, still a feat of construction. A little unusual, as cyberdiva said; a welcome diversion. Dave G, I agree totally, even about the DEETS I never heard of. Thank you. 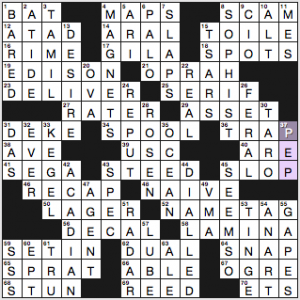 The adept crossworders always love difficult Monday or Tuesday puzzles. The less adept not so much. For me, Amy is right this is not a good Tuesday grid. I generally avoid reading the notes, so I went in blind. But it didn’t take long to grok the theme even then. I was not a big fan of this one—it felt like a slog. 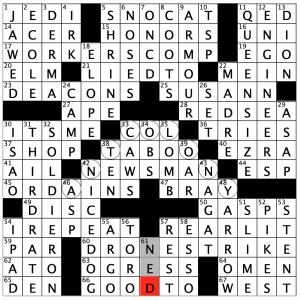 The theme left no room for sparkly answers in the grid, and the whole “which word clues forward, which backward?” grew stale by the third across answer. I liked the NYT. But it took me far longer than usual to complete it. 12 minutes. Took me significantly longer than my average Tuesday. The entries were not too elusive, but the ambiguity factor slowed me down. I agree with it being a simpler Thursday-type. But my averages are still changing… I did like the cluing broadly. DEETS is a yes from me. It’s seems like a newer version of “the 411”. I thought the NYT was a good and novel puzzle, but it was not Tuesday-level. I think a Tuesday-level solver would just be baffled, particularly by the undetermined order of the clues for the across entries. The circled letters of ANTCOLONY form an ant hill! LOVED the Tues NYT. I think Wednesday might have been a better home for it except i’ll note this — this was easy for a tricky theme, and it’s not a bad idea to expose novice solvers to some of the tricks that might await them when they venture onward to the wild and woolly hinterlands of Thursday+. Sometimes titles are hard. But I pictured FLY AWAY as fly (like a bird) and “a way”. It was the first thing I thought of. Free puzzles at my site alexashortbush.net or via my twitter. Thanks. Scroll down or look down for PDF. They are at the bottom of the puzzle pages beneath the grid. . Enjoy. Loved today’s NYT, including DEETS. It’s also a great challenge for those who like to solve the early-week puzzles using only the Across clues. Doing so, made it a perfect late-week puzzle. It’s more challenging to go Downs only, of course. You lose 90% of the theme clues! 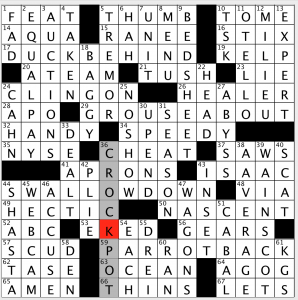 I’m gonna chime in as another fan of today’s NYT puzzle. The added layer did result in staler than usual fill, but the fun solve largely negated that for me. The note tips off solvers at the very start (if they choose to read it), keeping it within the grasp of novice solvers (I think). 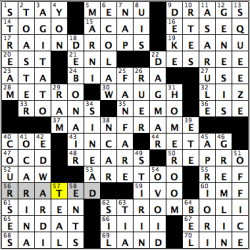 Like Amy, I instinctively filled REASK only to be turned off when I discovered the correct answer is the uglier REPUT. I’ve solved a couple of Tim Croce’s anagram puzzles recently (all answers are clued as their anagrams), so this was a relative walk in the park (but slower than my average Tuesday solve). For a dyslexic this was impossible. Had to do it by the downs. I know this is a late query, but what does ASP have to do with the theme of the LAT? I got all the rest of it, including the circled hill, but … this will keep me awake. Just that the ant colony starts in that entry.